Do Online Colleges Accept Everyone Who Applies? Online colleges often gain a bad reputation, and some tend to think that online college acceptance rates are higher than the rates found among traditional colleges. Though some online schools may not do a good job of preparing students for the future and accept anyone who applies, other schools are much more stringent. Before you place too much importance on the number of students admitted into a program, gain some better understanding of online schools and how those schools differ from a traditional university. You cannot simply enroll in college and show up on the first day of classes. Before beginning your studies, you must apply for admission. Admission requirements vary from school to school, but most colleges request that you fill out an admission form and pay a fee. Some schools have an essay requirement that asks to write a long or short essay based on a prompt or question. You will also need to submit a transcript that shows the grades you received in high school and show proof that you have a high school diploma or a GED. How Does an Online College Differ? Applying to an online college is slightly different than applying to a community college or a university. These schools often ask that you complete all application components online and arrange for your former school to send the college a copy of your transcript. Online schools may also request that you show proof you have access to the Internet and any software that you need in the program. This may involve you sending screen captures that show the operating system you have. The school may still require that you complete an essay as well. Those who look down on online schools often assume that those schools have the highest acceptance rates. The acceptance rate refers to the number of students admitted against the number of students who applied. While some schools do have a policy of accepting 100% of all students who apply, other programs are much more selective. Some traditional schools offer students the chance to complete their degrees online, but those students will still need to submit the proper paperwork and face rejection from the school. For profit schools generally have a higher acceptance rate and may accept everyone who applies. When looking at online college acceptance rates, it’s important that you think about how those rates apply to traditional schools. Community colleges generally accept anyone with a high school diploma or a GED, though students with poor grades may need to take introductory courses before working on a degree. 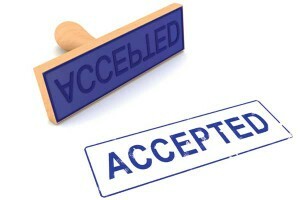 A report from U.S. News & World Report found that 100 schools across the country accepted 100% of those who applied. Those colleges included schools in New York, Washington, Arizona and Delaware. The report indicates that some of the more traditional colleges that offer classroom experiences have a higher acceptance rate than some online schools. The top schools in the country have an acceptance rate below 10%, but some good colleges have a higher acceptance rate of 70% or more. Though some people assume that online schools are easier and that online college acceptance rates are higher than the rates reported by traditional colleges, some online schools are more selective than traditional colleges.